Keeping muscles toned and strong is just as important for kids as it is for adults, and every kid should partake in some form of strength training on a regular basis. Since a child's muscles, bones and tendons are still growing, lifting weights may pose an injury risk -- but body weight exercises, like pushups, are safe and effective. 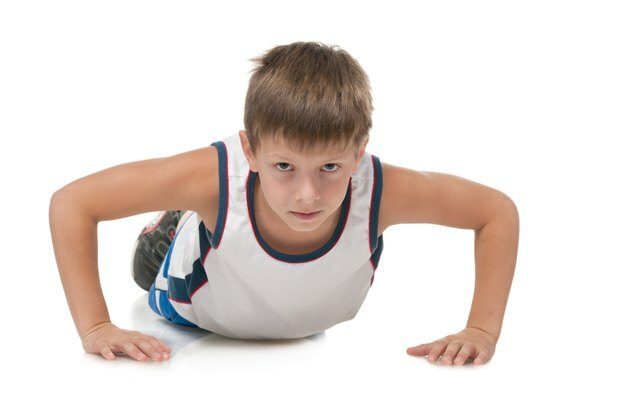 Pushups are an upper-body strengthening exercise you can modify for kids if they can't perform full repetitions when getting started. Stand 2 or 3 feet away from a wall with your feet positioned a little wider than shoulder-width. Lean forward so your weight is on your hands on the wall. Perform pushups on the wall until you're comfortable with the motion. Move your feet back a little farther when this movement becomes easy for you. Practice getting your body into the plank position required for a pushup by doing a stationary elbow plank. Get on the floor, and rest on both elbows and toes with your body stiff and straight off the floor. Practice keeping your bottom down, but don't let it sag, as these are problems many kids experience when they first try pushups. Position yourself in the same plank position, but take your elbows off the floor and place your hands there instead with your palms facing down. Lower your body straight down until your chest almost touches the floor, and then push back up to the plank position. Keep your head up and gaze straight ahead. Place your knees on the floor instead of your feet if you want to perform the real movement but can't push all your weight up from the plank position. Bend your legs so your feet are up off the floor as you perform the pushups. Start a full pushup in the top position, so you don’t have to push your weight up right at the start.